Oliver Lake and Donald Robinson put on a terrific set Thursday night at the Outsound New Music Summit. Obviously, that’s what you would expect. Lake is a living legend — but I was also there to see Robinson, a Bay Area drummer whose skill I’ve lauded here repeatedly. A duet with a kindred spirit (both were part of the free-jazz scene in Paris in the ’70s) was the perfect setting for showcasing Robinson’s talents and creativity. Lake announced his presence with a keening, whistling cry on a miniature curved saxophone. It got the music started with almost no preliminaries and also served as a signal that yes, the avant-garde stuff was going to be welcomed in this set. Spending most of the hour-long set on alto sax, Lake frequently alternated between rapid-fire chatter and fragments of jazzy, funky melody. Robinson rotated through a few choices of sound palettes, from hard mallets to sticks to brushes. I love the light touch he has on the drums — airy, rapid-fire gestures that build up to a reeling ferocity. This was a polished set, in a good way, by a couple of pros. The flow of ideas was seamless, aided by Lake’s occasional use of melody to shift the mood. These moments were brief, terminated by a quick spackling of wild sax notes, but Lake and Robinson did let a bit of a groove develop during their lively closing improvisation. The evening opened with the trio of Brandon Evans (sax), Christina Stanley (violin), and Mark Pino (drums). They set the tone with a long-form piece of Evans’ devising, an improvisation based on what appeared to be a graphical score and/or a set of instructions guiding the overall flow. The piece was a frenzied display of power. Stanley, in particular, made the most of it, madly sawing to keep the energy level red-lined while also using occasional electronics to deliver more pulverizing sounds from the violin. Evans was terrific on soprano sax, but that instrument didn’t offer much contrast to the violin. That might have been the desired effect; both instruments melted into one another to form a continuous chatter. But I appreciated Evans’ contributions more on alto, where the contrast in sounds made it easier to separate his voice from Stanley’s. It was a take-no-prisoners session, which puts pressure on the drummer to keep the energy level peaked without overpowering the sound. I did feel like Pino fell into occasional ruts early in the piece, but he quickly found his footing and was soon tossing off some impressive fills and rolls. These two sets complemented each other well. Not because both included improvised sax and drums, but because each started from the premise of “jazz”-like improvising on acoustic instruments and followed a different direction from there. A nice pairing of acts by Outsound. Well known for his piano work in long-running bands like the Fonda/Stevens Group and Gebhard Ullmann’s Conference Call, Michael Jefry Stevens turns out to have a soft spot for the brass family. He got his start back in grade school playing the trombone, and he wrote this set of compositions specifically for a brass-heavy band: two trumpets, two horns, and Stevens’ own piano. Brass stuffs your ear and consumes your attention, and Stevens doesn’t resist this. Much of the album has the four horns up front, with Stevens’ piano playing along in an almost percussive role, mimicking the clipped, non-resonant sounds of brass. Elsewhere, his compositions use horns to set the stage until the piano arrives in a starring role, curving through the melody as if navigating a maze. Stevens’ compositions apply the brass in a few different ways. “Temperature Rising” is a funky groove that keeps the beat even as the music dives into a colorful group improv. It reminds me a little of David Byrne’s Music for the Knee Plays. “Variables” and “12 Chatham Road” use strategies that feel closer to classical experiments. The former is like a percussive game, with the horns pecking out composed, interlocking lines, getting gradually louder until the piano comes in with the same pecking approach. Then there’s “To the Glory,” which puts the horns in a slow, reverent mood — think of the closing credits to a film, with some piano in a jazz “color” to brighten the scene. It’s more fond remembrance than mourning. Brass Tactics also includes four improvisations with titles based on temperatures. “Twenty Degrees Farenheit” is appropriately icy and distant, with bass piano notes against a frigid trumpet.”Forty Degrees Celsius” is warmer and percolating, with the horns dancing and weaving while Stevens adds some ghostly piano texture underneath. Starting tomorrow in San Francisco, the week-long Outsound New Music Summit will convene for the 15th time. It’s a week-long series of shows celebrating creative music of many stripes, from jazz and new-classical to noise and prop. I’ve written about the event quite a bit over the years, and you can also learn more by digging through the Outsound archive. The event runs July 24-30, at the Community Music Center (544 Capp Street @ 20th, San Francisco). Check out the full schedule here. For a deeper look, you can explore the “In the Field” series of video interviews, posted by Outsound organizer Rent Romus. They’re extensive (usually 20+ minutes) and often explore how these musicians got turned on to creative music and out-there sounds. Here’s my smattering of highlights — based primarily on how familiar I am with the musicians and concepts. Meaning, I’ve left lots of deserving artists behind; explore the full schedule for more info, with additional video and audio information. Concert times are 8:15 p.m., except as noted. Touch the Gear (Sun. July 24, 7:00-10:00 p.m.) — An Outsound tradition. It’s a hands-on exhibit of electronics and noisemakers (and sometimes some more “normal” musical instruments”), giving you an opportunity to find out where some of these unusual noises come from. It’s very informal and, well, noisy: You wander the tables, ask some questions — and push some buttons and make some noise yourself. Sonny Simmons documentary (Mon. July 25, 7:00 p.m.) — A screening of Brandon Evans’ 2003 film, “Sonny Simmons: The Multiple Rated X Truth.” Simmons is a fascinating story, a forgotton hero of ’60s free-jazz who became re-remembered starting in the early ’00s. Dan Plonsey: “On His Shoulders Stands No One” (Tues. July 26) — Expect Braxton-like expanse, but with a friendlier, warmer touch than Braxton’s Ghost Trance Music or Echo Echo Mirror House. Find out more in Plonsey’s video interview (embedded here). Brett Carson’s Mysterious Descent (Tues. July 26) — A theater/poetry/music piece based on the extant texts of the Idnat Ikh-ôhintsôsh (i.e., a language of Carson’s own devising). Might be the most “out-there” concept on the docket. I’m not sure what to expect; I just got drawn in by Carson’s “In the Field” inteview. Vinny Golia, Lisa Mezzacappa & Vijay Anderson (Wed. July 27) — Three musicians whose work I’ve enjoyed and admired. This should be a rewarding set of sax-bass-drums improvised jazz. Note that they’re also three-fourths of the band on the album Hell-Bent in the Pacific, which included the late Marco Eneidi on sax. Oliver Lake & Donald Robinson (Thur. July 28) — Outsound goes above and beyond to support local artists, but the festival also usually includes notable names from out of town. Oliver Lake is a luminary known for the World Saxophone Quartet, Trio 3, and his extensive solo career. (See SF Weekly‘s preview.) Donald Robinson is a hero of the local scene, a drummer whose fluid, airy style has always impressed me. He’s also a veteran of the early ’70s free jazz scene in Paris, where his musical cohorts included Oliver Lake. Who knows whether they kept in touch or even knew each other well; in any event, this should be a special dialogue between kindred spirits. There’s also a trio improv that combines Brandon Evans with local luminaries Christina Stanley (violin) and Mark Pino (drums); an avant-pop night promising shades of prog and electronic music; and an appearance from the long-running, unpredictable Big City Orchestra. And plenty more. Seriously, explore the schedule. There’s a wide range of music in store. It wouldn’t necessarily be interesting. If you interpret the lines as a six-lined music staff, you might get just a block of white-noise chords. If you decide this is a single line denoting rhythms and spaces — now you might be getting somewhere. I found the photo on the Spoon & Tamago blog, which tracks cool art and design projects coming out of Japan. The birds are seagull-like creatures called kawau (they’re cormorants, according to the Wild in Japan blog), once endangered and now repopulated to the point of becoming a nuisance. Photographer Yoshinori Mizutani produced a series of these photos, turning the birds into stark, surreal visions — some of which really do look like they’d make interesting graphical scores. A photobook is pending. Check out Spoon & Tamago for more info. Last weekend, sfSound — a very active Bay Area new-music collective — put on a three-night festival exploring graphical scores. I missed the first night, which included new works by sfSound members Kyle Bruckmann and Matt Ingalls. But I did make it to the final installment, featuring classic works by some big names. The centerpiece was Pierre Boulez’s Domaines (Dominoes), a through-composed work broken into modular pieces that can be rearranged, within some strict rules. It happened to be the longest piece of the evening, but it was also a highlight for its use of space, which made the piece feel sprawling and epic. And it was a workout for clarinet soloist Ingalls. Domaines pits a solo clarinet against six ensembles, each numbering one through six members. These small ensembles were spread out around the theater space, including the 1-person bass clarinet sitting in the central aisle in the audience. Boulez’s instructions have the soloist play a segment with each of the ensembles in a prearranged but arbitrary order. Ingalls started with segment number 4: He played his part, alone, followed by the 4-person ensemble playing their part. The modular part comes not only from the sequencing of the six segments (Boulez called them “cahiers” — notebooks), but in the clarinet solos, which are divided into segments that can be played in two different ways. 4 was a good place for Ingalls to start, because that clarinet solo featured raspy, brash tones — a personality that would turn out to really stand out from the others. To accent this, the 4-person ensemble consisted entirely of trombones, keeping that same raspy sound going. Here’s the fun part: Ingalls had his own music stand next to each ensemble, so for each segment, he stood in a different place. As the piece progressed, in the order 4-5-2-6-3-1, Ingalls had to walk the room. As I mentioned, the sequences were predetermined, so as one segment ended, Ingalls or the next ensemble could start the next segment, often overlapping the two by a bit. That was a nice effect, kind of like cross-fading in radio. But wait, there’s more! That was only half the piece. The second half, subtitled “Miroirs” (“Mirrors”), consisted of each ensemble playing a segment, followed by a clarinet solo — the opposite concept of the “Originales” segments, but with different music. sfSound played the “Miroirs” segments in the order 5-2-3-4-6-1. And of course the music, while through-composed, is Boulez: spikey, poking phrases, huge leaps, swooping slashes, and the occasional bit of extended playing as indicated in the sheet music. Exciting stuff, augmented by the effect of Ingalls and the ensembles playing from different regions of the room. I also happen to enjoy geeking out on things like permutations. If I’m using combinatorics correctly, there are 518,400 ways to arrange the six segments. Factor in the two choices for each clarinet solo, and I think it multiplies to more than 2 billion possibilities. Every concert is unique, even if the music is through-composed, but I really like to geek out about the uniqueness of a permutation. We heard one possibility out of 2 billion that might never arise again, and I found that really appealing. The rest of the concert featured pieces that allow many more degrees of freedom to the musicians. These ranged from the box notation of Morten Feldman’s “Out of ‘Last Pieces'” (excerpted at right) to the modular segments of Earle Brown’s “Available Forms” to Pauline Oliveros’ Fluxus-like “The Inner/Outer Sound Matrix.” The latter, written for sfSound in 2007, instructs the performer to “listen inwardly for your own sound” and play it — or not — at the right time. In most cases, the effect was like an episodic large-group improvisation. That is, the basic sound was similar to symphonic improv, but there were definite spikes and surges, as well as group drop-offs. Each piece came across boisterously, like a pot boiling, with clusters of activity coming from different parts of the group. Oliveros’ “Matrix” was loud and brash, which surprised me. I’d expected something more meditative. But the volume built up quickly, and it seemed at times as if players were forced to out-shout each other to be heard. The group also performed Oliveros’ a capella “Sound Patterns,” comprised of vocal sounds including vowels, tongue clicks, and various buzzes and barks. It’s a mostly non-improvisational piece, and while it’s not a virtuoso turn, it requires organization and an ensemble that takes the idea seriously. Hearing groups of people making the same nonsense sounds in unison turned out to be revelatory. Even though there’s an absurdity factor (a couple of segments seem designed to get a chuckle from the audience), and even though the ensemble was clearly having fun, their professionalism made this into a piece to be taken seriously. I was surprised how much I enjoyed it. It’s not that the collection is so vast. It’s that the process holds my interest only in short spurts, followed by weeks of not really caring. Also, because of the noise involved with the CD burner, it’s not something I like to do while listening to music or even watching a baseball game. Another thing that slows me down is that I’ve been lingering over certain CDs, rediscovering them or maybe really hearing them for the first time. Maybe I wasn’t paying much attention the first time around — or, maybe there are musicians or ideas on there that I wasn’t yet attuned to. That’s what happened as I slipped Rob Wasserman’s Trios into the burner. My collection includes a lot of rock music that I’ve become disinterested in, and this CD, while quite innovative as far as the classic rock crowd is concerned, is a good example. A critics’ favorite back in the ’90s, Trios was a project where Wasserman, a well known studio bassist, gathered unorthodox pairs of musicians and recorded a couple of original songs with each group. “White Wheeled Limousine,” with Bruce Hornsby and Branford Marsalis, was the song KFOG radio loved to play. This is not the kind of CD I’ve been lingering over. I rip ’em for the same of completeness, then stick them back on the shelf. Well, here we go. Brian Wilson and Carnie Wilson. Check. Elvis Costello and … Marc Ribot! Hey, that’s cool. Check. Edie Brickell and Jerry Garcia — ooo, I’d forgotten about those songs. They were cute. Check. Matt Haimovitz and Joan Jeanrenaud …… wait, WHAT?! Yes. Two of the tracks deep on “side two,” tracks I’d ignored back in the day, are instrumental trios with two cellists famous for championing new classical music. I really like both of these artists. I had Haimovitz and Jeanrenaud in my collection all those years ago, and I never knew it! The songs are good, if not life-changing. “Gypsy 1” has Wasserman sticking to a bass pulse while the two cellos solo around a folky dance melody — I’m hearing more Irish than Gypsy in there. It’s reeling and circling and loads of fun, with both cellists adding lots of little frills and glissandos to make it even more peppy. “Gypsy 2” is more serious, with a main theme that’s more Eastern European to my ears — more gypsy-like. The track is rewarding but lacks the ear-grabbing, A-side quality of “Gypsy 1.” You do get to hear Wasserman play a bowed solo toward the end, though. They made for a fun listen. But now, Trios is back on the shelf, and I’m moving on. If you’ll excuse me, I have to deal with a Widespread Panic CD that I never really did get into. 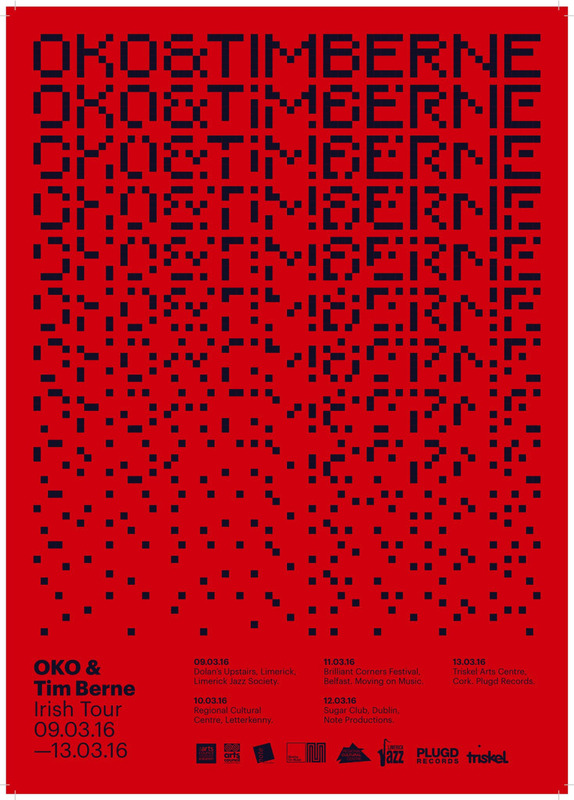 Back in March, Tim Berne got invited to Dublin to play with the electronica band OKO. Asked by the Irish Times about his musical plans for the gigs, he said he had no idea. OKO hadn’t revealed a strategy, and it sounded like Berne had been given only surface details about what the band even sounded like. But the Irish Times article dropped a few hints. Oko plays with electronic and acoustic instruments. They’re experimental and cross-genre — well, yeah, the press loves to put those labels on bands that turn out to be bland and monochromatic. Ah, what the heck. In the spirit of the Berne concert, I downloaded I Love You Computer Mountain and gave it a shot. Turns out the Irish Times wasn’t far off. “Shoehorns & Axelgrease” opens the album with a nine-minute tour of the quartet’s collective digs. It starts mysteriously, with cavernous gloopy noises accompanying light ambient chords and faint electronic blips. The music eventually surges into a sprawling, cymbal-splashing slow groove, then takes a sharp turn into a kind of prog-jazz jam of electric piano, snappy rhythmic bass, and colorful drumming. “Under Over” brings a madcap beat lead by rubbery bass, over which Darragh O’Kelly jabs out some funky electric piano before switching into a scrambling, odd-time-signature riff. We’ve gone from oh-so-hip electronics to a good old prog/fusion festival. You could describe the overall album as “chill,” but it gets a lot of mileage out of some hard-driven bass and drums. The former comes from Shane Latimer on eight-string guitar — a compelling, lively sound, even when he’s playing in linear eighth-note pulses. Shane O’Donovan lays down solid beats and colorful fills on the drum kit. O’Kelly’s keyboards, principally electric piano, provide the lead voice and are responsible for defining mood. It’s all augmented by samples and whatnot from DJackulate for a touch of hip atmosphere. Tim Berne would be an obvious match for the more abstract tracks, but I’d bet it was amazing to hear him on the more locked-in and composed pieces as well. He’s no stranger to more conventional music, after all — check out his work with bassist Hugo Carvalhais’ band a few years ago. If you happened to catch any of the shows, I’d love to hear what you thought.